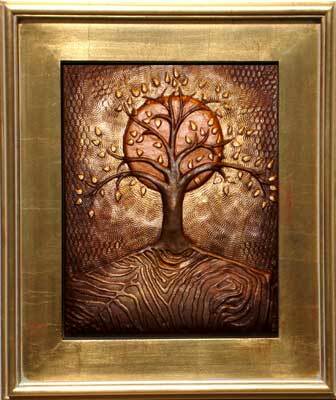 These lovely Tree of Life interpretations by artist Teresa Howley are representative of the story of the tree of life. Shown above is The Blessing Tree which is made of colored primo polymer clay with resin coating and patinas. The piece meaures 10 inches x 10 inches and sells for $250. Shown above is The Kissing Tree which is made of cast resin and bronze powder. The piece measures 13.5 inches x 15.5 inches and sells for $500. 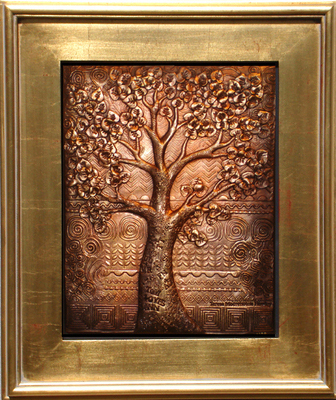 Tree # 2 shown above is made of cast resin and bronze powder and measures 13.5 inches x 15.5 inches. It sells for $500. Each Tree of Life sculpture is part of a limited edition. If you have been struck by one of these lovely art pieces, order it now.